Instagram is a great channel for hotels to give guests an inside look at their property. With over 200 million users on the popular network, it’s an excellent social media app for hotels to begin using where they can showcase their property photos and the local area. Though it’s very useful, Instagram can be time-consuming for a hotelier. It requires taking time out of their busy day to snap a photo, write a post, edit the photo, enter hashtags, then post. 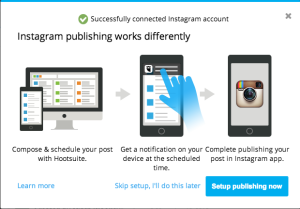 Apps like Latergramme and ScheduGram have been on the scene for a while now, which allow users to schedule future posts, but if you’ve been using Hootsuite to schedule other social media posts you’ll be happy to hear that you can now use Hootsuite to schedule Instagram posts as well. 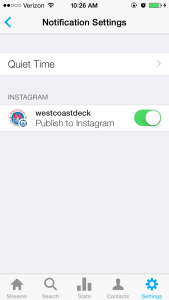 Note: Instagram scheduling works differently than scheduling other content. It is not posted automatically and takes further steps to post. Select Instagram and click ‘Connect with Instagram.’ A pop-up will appear where you are prompted to add your login information. As mentioned above, there are more steps to posting than just scheduling. You will also need a smartphone that you will regularly have access to. On this phone, you will need to download both the Instagram and the Hootsuite apps. Once they have downloaded, log into both of the apps with the accounts you will be using. You will need to make sure that you are able to receive notifications from these apps on your phone, which is part of the scheduling and posting process that will be discussed later. 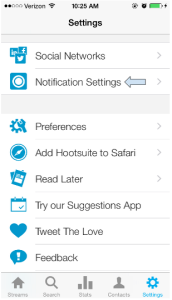 To turn on Hootsuite notifications on your phone, click setting at the bottom right of the app, and click notification settings. Next, make sure the settings for publishing to the Instagram account is enabled by moving the little button to the right so it’s green. 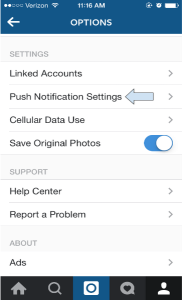 To turn on notifications for Instagram, go to your Instagram profile page and click the settings button at the top right of the screen. Since you will most likely want to monitor all types of activities on Instagram including comments, follower requests, etc., it’s a good idea to turn all notifications on. 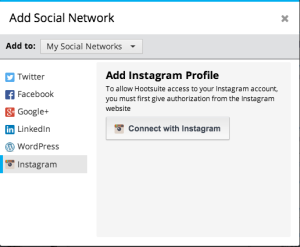 In addition, you will need to make sure that your phone settings allow you to receive notifications from both Hootsuite and Instagram. Once your Instagram account is added to the apps and notifications have been turned on, you can create a custom tab for the account. You can then personalize your streams as you have done for your other accounts.